Check out these tasty deals we’ve cooked up for you. These bundle and save offers are a great way to get wild at a discounted price without sacrificing the fun factor. Choose your adventure and save! Indulge yourself in an exclusive, behind-the-scenes experience guided by an expert member of our animal team. This in-depth 3-hour adventure will expose you to a side of Out of Africa Wildlife Park not otherwise seen. With this upgrade, you can expand the highlights of the regular safari tour (included with general admission) with an hour-long ride on an Unimog off-road vehicle. Surround yourself with free-roaming African wildlife! 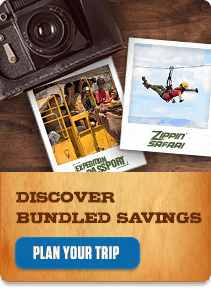 Whether you’re interested in a full zip line tour over exotic animals or you’re just looking for a single-line zip experience to put the exclamation point on your day’s adventures, we’ve got you covered. If you’ve ever wondered what happens at a wildlife park after the last guest leaves, this is your chance to find out firsthand — the perfect opportunity to see animal behavior under a canopy of stars. Heighten your experience with a close encounter of the wildest kind. Personally feed breathtaking tigers and you’ll gain a new and up-close appreciation for how big and powerful they really are. Completely safe!